I tried my hand at an orienteering event this week, organised by the local group. I have never done this before, and I need to practice my fine navigation skills. I told them I was new, so they put me on the moderate course. I didn't know what to expect, but I had no problem navigating sometimes with compass assistance, but mostly off map and terrain features. I got around the course is fairly good time. I didn't really go flat out at all, and deliberately used my compass for practice even when I didn't need to. 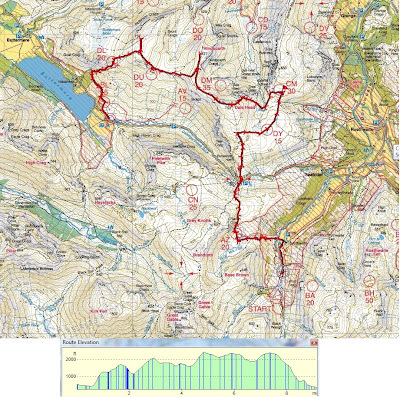 The course was only 3.3km with 105m of ascent. It took me around 26 minutes, and I got to use the Sport Ident, electronic controls, for the first time. I had better get used to them, since all orienteering and mountain marathons use them. I consider myself a novice navigator really, but even I found the course very straightforward, and doubtless need a bigger challenge than a small orienteering course. As it turned out I logged the fastest time, but that really isn't much to be proud of when you are racing teenagers and pensioners is it! So, I will have to seek more challenging orienteering! 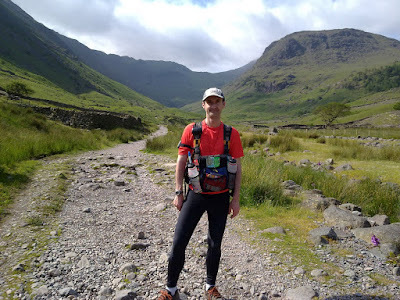 This weekend just gone, I went to the Lake District armed with the day 1 and day 2maps from a Mountain Marathon. The event itself was cancelled on day 1 due to severe weather. I was half hoping that I would get some bad weather to, so I could test out my navigation skills in harsh conditions. As it was, the weather was perfect. If anything, it was too hot. However, I had to be prepared for any eventuality, so I had an 11kg pack, including tent, waterproof clothes, warmer clothes, cooking equipment and 3l of water. I downloaded the Medium Score day 1 and day 2. This is basically 6 hours time limit on day 1 and 5 hours limit on day 2. On the map are various controls. You decide which ones and how many you want to visit within the time limit, choosing any route between them (within the rules). If you finish late, 2 points are deducted for every minute you are late. So, it is important to know how much ground you can cover in the time allowed. 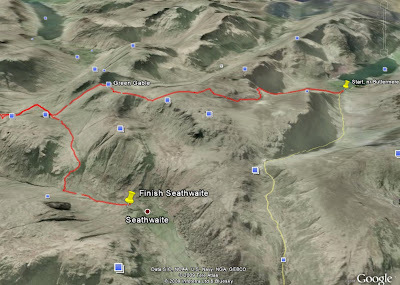 I left my car at Seathwaite, and planned my route. I decided to would try and get 6 of the controls, with a possible option for more if time allowed. Below is the map. My start point indicated by the red triangle, towards the bottom right. Here's a photo taken at the beginning, about 9:45am. I would be navigating from a Harvey 1:40k map, and compass, not GPS. I did however, have my GPS along to log my route (as you can see above), to check for mistakes when I got home. 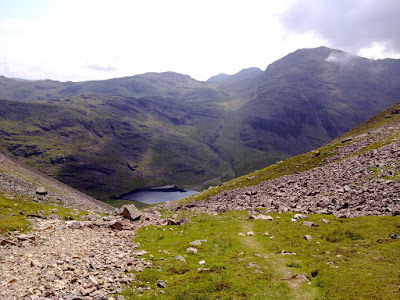 The route begin with a very steep climb, with some all fours scrambling, out of Seathwaite up towards A mountain called Grey knots. A plateau underneath the summit was the location of the first control. My navigation was a bit sketchy here, just getting used to the map, but all was well in the end and the location was found. 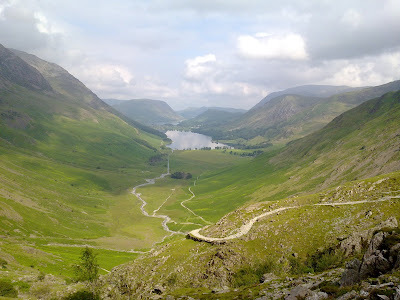 From there it was up and down to Honister pass. I refilled my water bottles at the Youth Hostel there, though in the real event I would be refilling by bottles from streams. 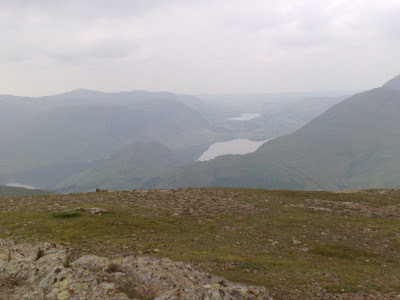 Next was a climb up Dale Head which is another good climb. Just before the summit I had to head East and locate a Tarn (a small lake) for the next control. The visibility was excellent so I found the Tarn very easily (as pointed out by me below). I then made my way North towards High Spy for the 3rd Control. Now by this time around 2 and a half hours had gone by, so I decided there was no chance I could go for any controls further form the finish. 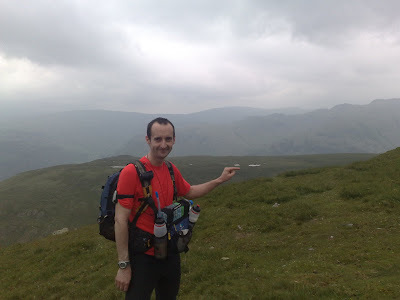 I opted to stick to the original plan, and head up to Dale Head summit. 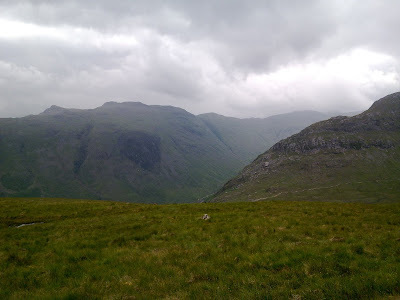 Then along the ridge to Hindscarth, and then Robinson, (I stopped the clock whilst I 'bagged' the summits - though I've been to all of these before anyway! ), picking up another control just before the summit there. 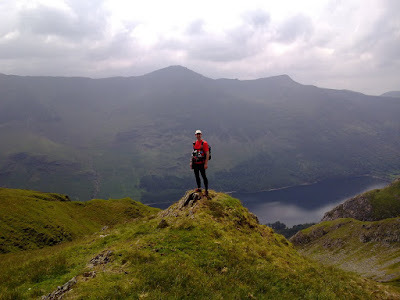 After that there was a toe crushing descent into Buttermere, picking up another control half way down, just near where this was taken. I made a bad, but easier navigation, decision to handrail down and around a wall. This meant I went in a semi circle, a longer route, but the navigation was a no-brainer. 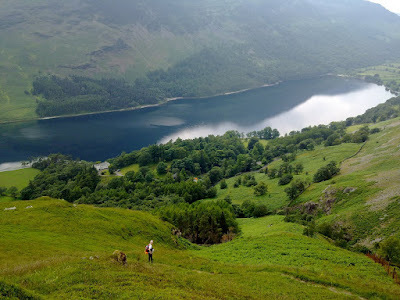 The ground was very tough; steep, with rocks under high ferns making for the ever present danger of a sprained ankle. I should have just opted for dropping straight off the even steeper South face of Robinson, which was a much shorter route. 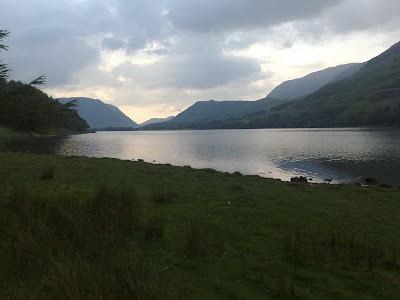 Here is Buttermere, the Lake where I camped that evening. As it was, I got to the final (compulsory) control with just 5 minutes to spare, though to be fair I had taken a lot of photo's etc. 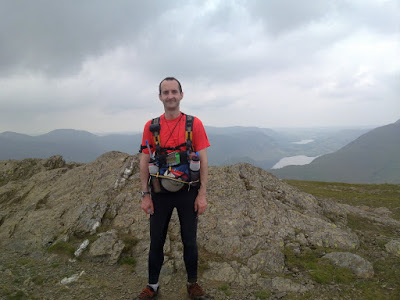 I had only managed an average of 1.5mph, 4000ft of ascent, 4200ft of descent, and covered just under 10 miles in the 6 hour limit. I would have got 110 points, but bear in mind I had perfect conditions, which I won’t have in October! Shortly after I finsihed it began to rain, so I did get some use out of my waterproof clothes, if only for half an hour. 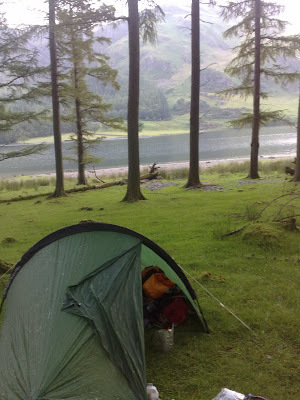 I camped in a little patch of trees on the far side of Buttermere Lake that night. The following morning I got out my day 2 map, and planned a route. Just for some variation here's a Google Earth view. 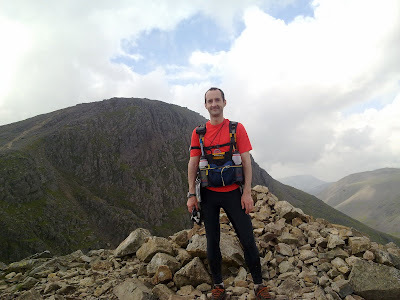 The route was about 8.5 miles long, and had 3500ft of ascent. 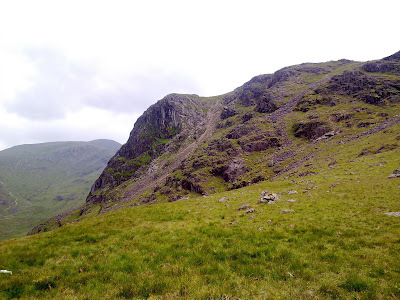 The route began once again with a stiff climb towards (but not up entirely) Fleetwith Pike, again some all fours scrambling, since I opted not to use either of the footpaths, and go for a more direct route straight up alongside the small stream and waterfall. 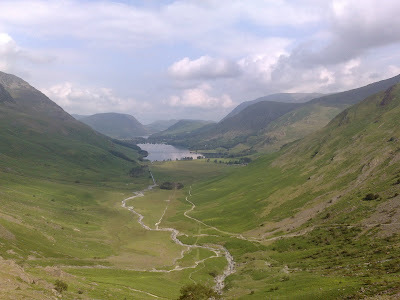 These were taken about half way up, looking back towards Buttermere. 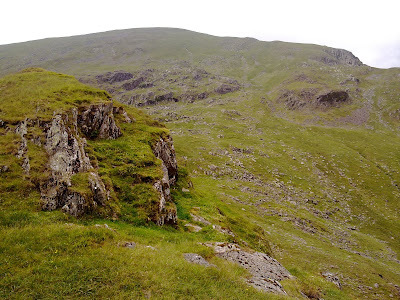 The first control took about an hour to get to (close to the Summit of Brandreth), and was quite challenging, as a Tarn featured on the map just wasn't there to be found! Still I was in the right place, I reasoned (and was proven right by checking GPS later). From there it was a long way to the second control I selected. 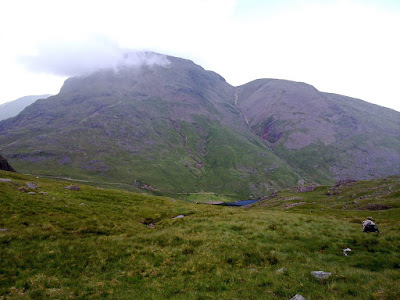 I had a crisis of route choice half way to Green Gable, but decided against a 30 point control just in case it meant I could not get a later control. 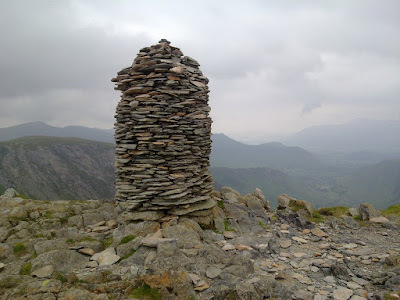 I summitted Green Gable, pictured below. It was another fairly steep descent. Here is a shot I took looking back up, the crease in the centre of the picture, being the descent. 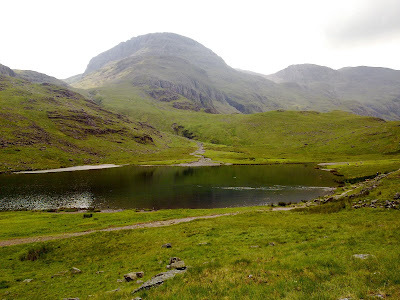 I picked up one final control just before Sprinkling Tarn, and decided I didn't have time to for an more as I had just an hour left to get back to Seathwaite. The descent was picky at times, and a little slow, but I got back with about 20 minutes to spare, and averaged 1.7mph. I logged 90 points for the day 2 effort. A good weekend training. My knee did hurt and times, so we'll have to see how it feels this week. I assume it is still healing from the operation. The discomfort has never really gone away. I hope it will soon. I may do an LDWA event this weekend, as well as the Harden Hard'un next weekend.